♥ FACT: Heart disease is the #1 killer of women. ♥ FACT: A woman is 10 times more likely to die from heart disease than from breast cancer. ♥ FACT: Today, in the US, 42% of women who have heart attacks die within one year (vs. 24% of men). When it comes to women’s heart disease, the statistics are unacceptable. 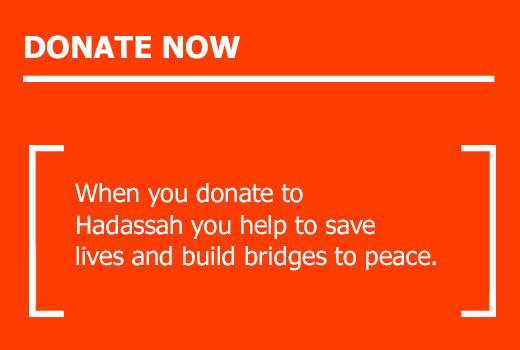 That’s why Hadassah is working to change the status quo for women. We’re making real headway. Identifying genetic markers of heart conditions to aid early diagnosis and treatment. Proving heart cells can regenerate following a heart attack with implanted adult stem cells. Deepening our understanding of the ways heart disease and heart attacks present differently in women. These are the kinds of facts we like, and the kinds of discoveries that save lives. With your support, we can save more lives. We’ve got our hearts set on it. That’s where you come in.